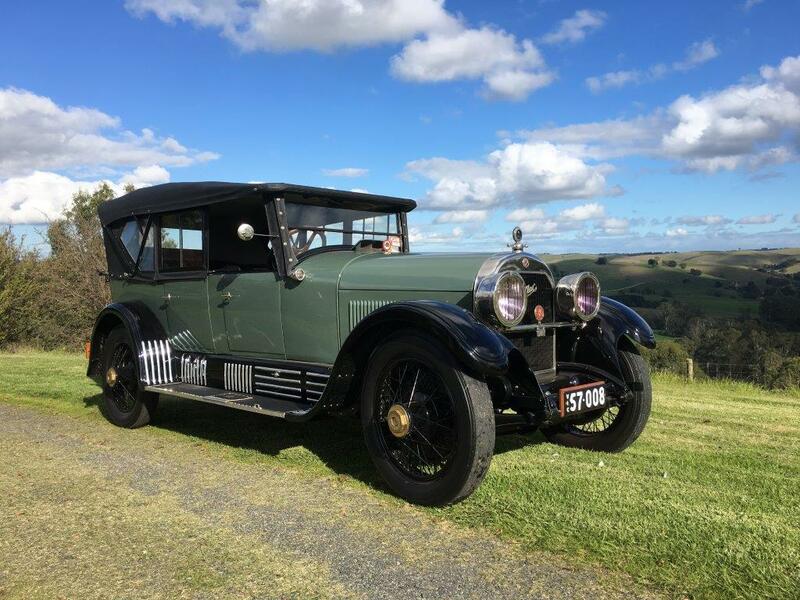 When Club member Malcolm Irwin read about the 1923 Cadillac that Bill Formby brought along to our August monthly meeting, he immediately thought of a past work colleague (Craig Emmerson) and forwarded the Idle Chatter write up to him. As you will see below, his colleague was very interested. It just so happens that Craig and his brother Scott actually own the vehicle along with a few other veteran Caddies from the very early 1900’s. Bill Formby is Craig’s cousin. Craig and his brother Scott inherited the car, as well as several other Caddies from their Grandfather Henry Formby. Both brothers are known across the world (particularly in the USA) for their knowledge and enthusiasm for veteran and vintage Cadillac vehicles. PRIDE and JOY by Craig Emmerson. This is a story about a Vintage Cadillac; it was my grandfather’s car when I first knew it and as a child, I was captivated from the start, admiring this Vintage Cadillac and its grandeur. The size of the car dominated my gaze, there was the giant step up to the running board and then another to the back seat. The excitement, as it travelled down the road, wind brushing my face, the smell of oil and fuel, the humming tune of pistons and of course the noise from the klaxon horn. These early childhood memories were the start of my Cadillac phase, which still persists just as strongly today. This V-63 Cadillac began its story at the Detroit Factory, entered on the build sheet in October 1923, given the Engine number 63F 953 and built Right Hand Drive. The seven seat Tourer body was painted Buckingham Gray, with black guards and optioned with rare 23 Inch wire wheels, there was also aluminum scuff strips for the valence panels and custom glass framed side curtains. The gear ratio was selected as Medium – 4.50 to 1, the only other two choices were high – 4.15 to 1 and low – 4.91 to 1. Cadillac during the V-63 models had 11 different body styles to select from. It is interesting to note from the build sheets I have, which include 350 engine numbers, that the most popular choice was the Seven Passenger Sedan, followed by the Five Passenger Coupe. This is in contrast to the seven Tourer’s and 4 Phaetons ordered by customers. This statistic matches the common Cadillac advertising in 1923- 24, not only were the adds worded towards the Closed bodies, but Cadillac were also actively targeting the female demographic. Another interesting fact which should be noted about our Cadillac are the rare optional wire wheels, the rarity is supported with the statistics from the 350 Cadillac’s on my build sheets, where only 6 Cadillac’s were fitted with the wire wheels and they all came to Australia. Americans opted for the standard wooden spokes. Cadillac designated the three open body styles as follows – Roadsters, A0001. Tourers, B0001 and Phaetons, C0001, My Cadillac still has the small aluminum pressed tag with the body number B -2022. The Cadillac Tourer was shipped from Detroit and arrived in Melbourne March 1924. The Mechanic and Salesman from the local Bongiorno Bros. dealership arrived at the docks, checked the car over and drove the Cadillac 230 miles to the township of Nhill, in Western Victoria. The Cadillac was purchased by a wealthy sheep station owner Mr. Henry Gladigau. I suspect he would have looked very grand, when he drove the new V8 Cadillac into town. At the time, a new Cadillac was worth around $3500 compared to the T Ford – $350, and a Dodge $950. From the Argus newspaper dated April 1924, it was said there were 1286 cars registered in Victoria for the month of March. Not surprisingly Ford was the at top with 188 and randomly selected down the page are Dodge-123; Chev-68; Fiat-31; and Cadillac at the bottom with 4 cars registered in the month. The original Owners certificate still remains with this car and highlights its colorful past, such as only being first registered in 1932. It would seem Mr Gladigau evaded the law for 9 years, driving his Cadillac unregistered. I’d like to imagine that Henry Gladigau, with mother in the front seat, was one day waved over by the Police for speeding in his V8, given a ticket for excessive speed and followed up with a 2nd ticket for an unregistered vehicle! The original registration designated in 1932 was 57008 and one original number plate still remains with this car today. 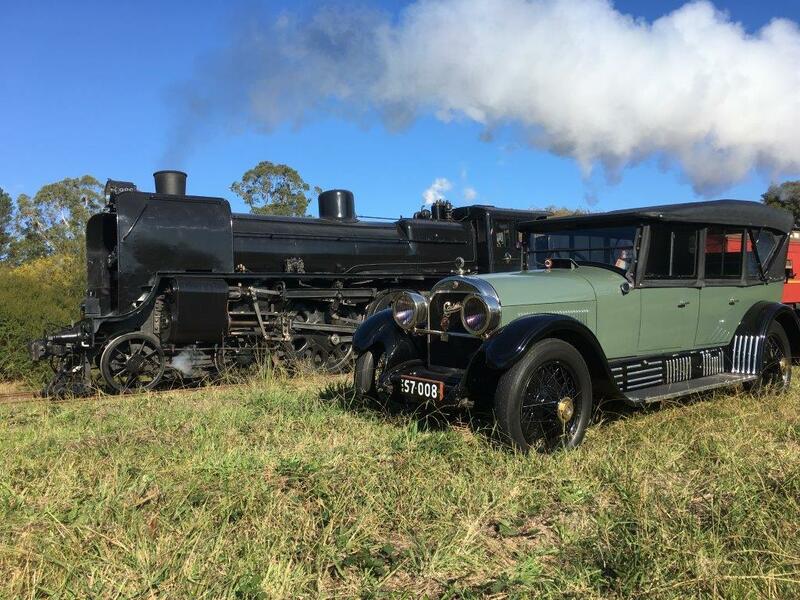 By 1938 after 15 years use Henry Gladigau traded the Cadillac back to Bongiorno Bros dealership in Nhill and the Cadillac then passed through 5 separate owners over 9 years, also changing registration numbers twice along the way – AE-527 and HJ-714. After surviving the Depression and a World War, being at a time when old cars were good for scrap, the Cadillac must have had caring owners and still served a purpose. By 1950 the V-63 was now found in the care of a Mr. Roy Foster from Moe Victoria. At a guess, the car was most likely deemed old, drafty and slow. Thus became its fate, mostly unused, it started deteriorating left under a tree on the farm. It was now 1958 and Henry Formby was involved in stock car racing. At a meet one weekend, he was given a lead about a big strong car, perfect for the rough sport of stock car racing. The following weekend Henry and his brother Jim, travelled to the resting spot of the Cadillac and, for the equivalent of $20 in today’s money, it was bought and loaded on a trailer and taken home to Drouin. After some fresh fuel and oil and a tow start the ’23 came to life. The Caddy would become Henry’s everyday car for the next 30 years. He towed a 16-foot caravan behind it on family holidays, attended countless Veteran and Vintage car rallies, and it wasn’t uncommon to see timber hanging out the side or a trailer hooked up, hauling another veteran car he’d found. One time on his way back from Geelong the ’23 threw a big end. Henry got word back to his brother Jim who came to the rescue in the old red truck (1949 Ford). The Caddy was loaded on the back and a course was set for home. Half way home disaster struck when the ’23 fell through the back tray and ripped up the main arterial through Melbourne. With level heads Henry and Jim jacked the Cadillac up, made it safe, and finally made it home. Both brothers were masters at being able to fix and make things run again. Most people would have hoisted the engine out of the car and embarked on the long process of re-building it, but that wasn’t their style. Henry ran the ’23 up onto planks with the Caddy on a severe lean and Jim welded the crack in the aluminum crankcase right there! Henry was only 63 when he passed away. He had a 1911, ’12, ’16, ’23 and countless others awaiting restoration in the sheds surrounding the property. Ten years on and the 1923 was the only Cadillac left, sitting quiet and still on flat tires in the back of the shed. Scott and I were inherently biased towards Cadillac’s from the start and so naturally, as we entered the work force, we started spending money on new tires and tubes, plus other sundries, attempting to have the Cadillac back on the road. As imagined the Cadillac required degrees of restoration for brakes and mechanicals, owing to the heavy use in the 60’s and 70’s; alarmingly there was a matter of a con-rod breaking on two separate occasions in the late 1990’s. The second con-rod breakage, actually punched a hole in the block, completely left the motor and almost became a new hood ornament on a Jeep, mainly due to the fact it was closely tailgating the Cadillac from the middle lane of a major freeway. We were able to collect the wayward con rod from its resting spot in the middle of the freeway and later place it with the two previous rods that had broken. The timing of this mechanical failure was a week out from a trip which we had planned to attend in Adelaide. We set about to have the car transported back home and the following day the motor was removed and dismantled. We were able to have the hole repaired and the motor fully rebuilt in 6 days. Sounds biblical, but on the 6th day … we drove the new motor nonstop from Drouin to Adelaide. Leaving in the early hours of the morning, I still can recall almost every slow passing kilometer on that trip. During the tour in Adelaide, the new motor was now run in and drove without fault, equally on the return trip back to Melbourne; the V-63 was a pleasure to drive. There have been many other heart-stopping moments when driving this vintage Cadillac – such as the time the right front wheel departed the car and bounced off at a rate of knots, headed directly for the local town’s library and computer shop. Recalling this the moment still haunts me. The actual moment felt as if it was in slow motion, as we watched the 23 inch wire wheel slice through the crisp morning air and, at a moment when all seemed lost, (being that the wheel was destined to smash its way, with expensive taste into the computer shop) the tyre struck a bricked garden edge, sending it into the stratosphere. Somehow, with divine intervention on its way down, it hit the building, banging square into a cement pillar, knocking all light fittings from the roof. The result was likened to an 8.5 earthquake on the Richter Scale. There were two other concerns simultaneously in motion at the time; the matter of the large brass hub cap tearing at missile speed through the air and the steering of the Cadillac as sparks flew when the brake drum tore through the road. By luck and almost with purpose, the wheel nut was shortly found, resting on a porch, on top of a Sunday morning newspaper. The wheel was re-attached and the Cadillac driven to the mechanic shop, where later all hubs were re-built and new threads cut. In 2013, with some curiosity, I had started to look more deeply into the woodwork of the Cadillac’s body and took the car to a restoration shop to have a small piece replaced. When I returned the following week to check on progress, I was shocked, the V-63 was just a chassis with mechanicals and the body was fully dismantled and stacked in a large pile. The full extent of the job had me on the phone with my brother and, looking back I can laugh, but after initially describing the magnitude of what was happening, the remaining part of the call was reduced to mere incoherent whimpers. Not a word was spoken, shock had set in. Reality was, the wood work was shot, and if I wanted my car back on the road, all new woodwork was the order. So, over the next 6 months new wood was duplicated from the old patterns and (naturally) in turn a new paint job was now warranted. This was a chance to explore the possibility of a completely new look for the car, thinking of color choice. We looked at everything in the red paint charts including shades from blue charts, dozens of samples were looked at, but the truth was, this car had a personality that was more rugged than a Crimson and more honest than a Midnight Blue. In the end, we decided to have just a touch more pastel than its previous Khaki tone and it now shines with a reflection of period correctness. The mudguards and valence panels were in rough shape and much advice was given to just have new metal shaped. In my mind, this would have greatly detracted from the original patina that this car has maintained. We gave the job to Bill Formby, to spend the time fixing and removing the rust, plus straighten the panels. To his credit he was able to duplicate a missing battery lock plus polish the countless aluminum strips which fit to the valence panels. Overall the new wood and the new paint job was completed over the course of 18 months. During which time there were many items that were newly nickel plated, also new leather gaiters, which cover the springs were made and fitted. Some years back we were able to salvage an old rusted V-63 Cadillac, this included an original good condition 6-volt battery. 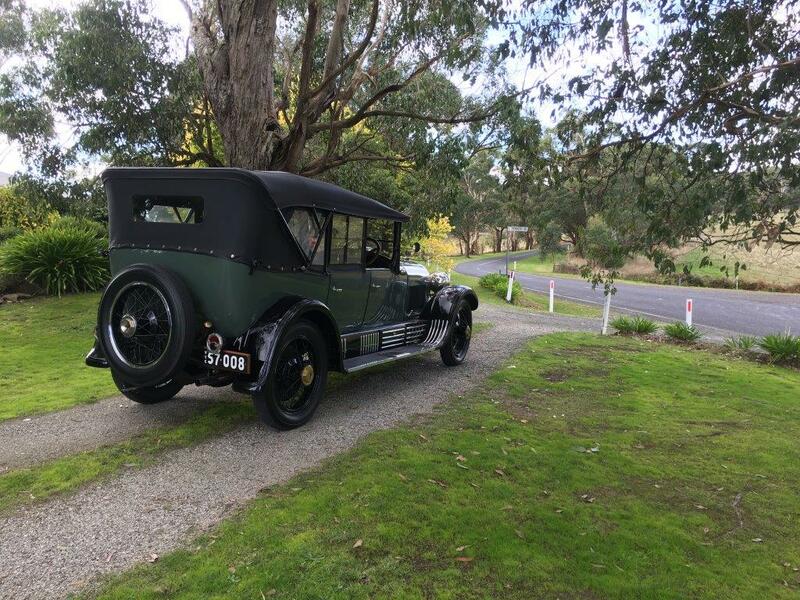 I was able to have the original case restored by a guy in Clifton Hill, Melbourne and now the original 6 volt battery, which once operated a V-63 Cadillac Sedan fits perfectly in the battery case space, operating a V-63 Tourer. After the major tasks of wood, body and guards were completed we then took the car to Grant White, the best vintage car trimmer in Melbourne. Grant followed the traditional Cadillac method with the new leather trim. In all there were 6 hides of leather used to trim the seven-seater body and the detail work involved in the correct edging and trim finishes are a credit to Grant. There were perfect patterns to study, as our Cadillac still had most of its original 90 year old leather intact, be it a little worn. One surprise discovered when removing the old leather, was the discovery of a print on the calico material, which dated the seat springs – “Made for Cadillac” December 1923. The Cadillac was cosmetically completed in time for the Cadillac Nationals in 2016. I admit this was a job that originally took us by surprise in its complexity, but, seeing the Cadillac at a fully completed condition I’m filled with pride. Every time I sit behind the walnut steering wheel, I’m consumed with nostalgia. I think about the men who worked on the assembly of this car, I think of old Mr Gladigau, taking ownership of his new ride, but mostly I think of the adventures that my grandfather had in this Cadillac. If only that V8 could talk! This is a Cadillac that has never known retirement, driven many thousands of miles in its first 30 years, saved and restored in the early 1960’s and driven many more miles in the following 30 years. Now part of the Formby family for almost 60 years, this most recent restoration will add a new lease of life and should see this incredible Cadillac continue on, hopefully adding new stories to be retold 30 years from now. How lovely! Bongiorno Brothers were my great-uncle and grandfather. My father would have been about to turn one when this beauty arrived in Nhill. I was only recently informed of your comment relating to the Cadillac and the Nhill motor dealership. I am intrigued to know if you have any past photos of your families dealership.